This was the Mass setting used in at the beatification of Pope John Paul II on EWTN on May 1, 2011 at the National Shrine of the Divine Mercy in Stockbridge MA. 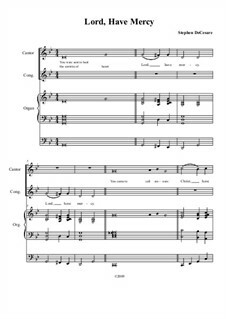 Vocal score and individual songs with their prospective accompaniment tracks are also available on this site. The entire Mass setting (including the Chaplet of Divine Mercy) which will make it easier for your church choir to handle without having to also read the full score instrumental parts. The full score, individual pieces with their prospective accompaniment tracks can also be found on this site. Dear Stephen, congratulations on this amazing work! The Mass is truly powerful and festive, it perfectly suits the occasion. I can imagine it would sound equally great at local church services too. os clientes que fizeram donwload "Mass of Divine Mercy" também fizeram download.